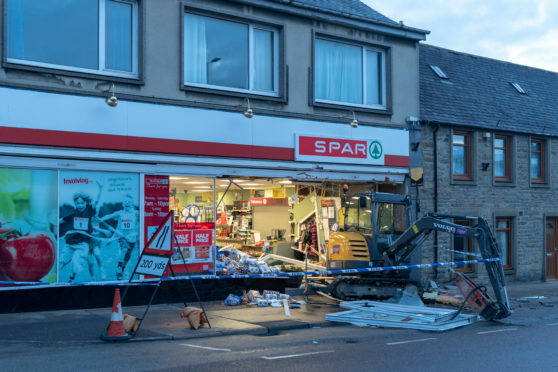 A digger was rammed into the Spar premises in Regent Street, Keith. Duncan Elrick appeared at Elgin Sheriff Court today following the incident at the Spar store on Keith’s Regent Street at the weekend. The 35-year-old, whose address was listed as Moray, has been charged with the theft of a motor vehicle, the attempted theft of a motor vehicle and driving while disqualified. Elrick is also accused of culpable and reckless conduct, theft by housebreaking and attempted theft by opening a lockfast place, namely an ATM. He made no plea when he appeared in private at court and he was remanded in custody.